A welding rod is used during the welding process to add material into the weld zone. When choosing a welding rod, the welder has to consider the type of welding and the material being welded. Every welding rod has a number that is assigned to it based on American Welding Society (AWS) standards. This numbering system allows welders to choose the right welding rod for whatever their application is. For arc welding applications, the filler rod also acts as the electrode in the electrical circuit. The AWS standards use the “E” prefix to label welding rods that are appropriate for arc welding. For arc welding methods that do not use a shielding gas, welding rods with a flux coating are used. The flux vaporizes at the tip of the welding rod, creating a gas that pushes the air away from the weld, resulting in a clean weld. 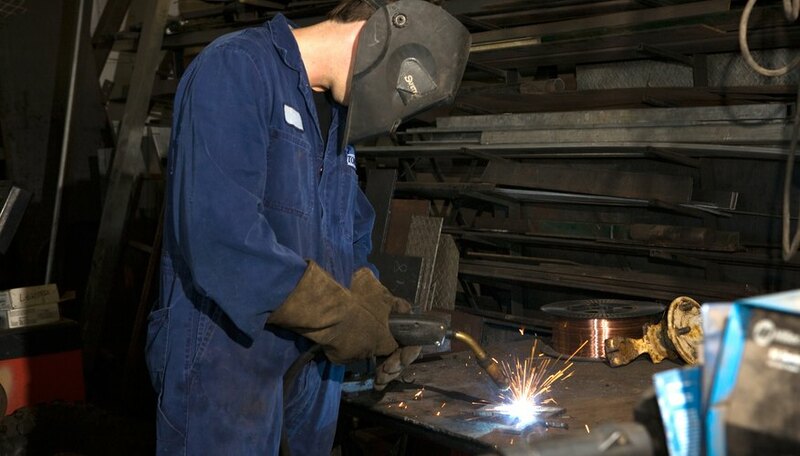 For manual welding, the rod is held in an electrode holder that connects the rod to the electrical circuit. For most welding applications, the material that the welding rod is made from should be similar to the material of the work pieces. If the work pieces are made from steel, there are many different options because of the wide variety of alloys. Steel welding rods can be selected for the tensile strength of the specific alloy. The beginning of the standardized rod number (after the arc welding prefix) will consist of a four- or five-digit number. The first two or three digits of this number state the minimum tensile strength of the material. In addition to monolithic welding rods, composite welding rods are also available. These rods are made from two or more materials, resulting in a higher quality weld. Metal-cored welding rods are made from a mild-steel shell filled with a mix of metal powders that are tailored to the exact alloy requirements. Some rods can be used for all applications, but others can only be used in certain orientations. The second to last digit of the AWS number states how the rod can be used. The number "1" indicates the rod can be used for any application, “2” indicates the rod should only be used for horizontal or flat applications, and “3” indicates the rod should only be used for flat welding applications. Depending on the type of welding method being used, flux may be required to create an oxygen-free environment at the weld creation point. Flux can either be applied to the work piece manually, or be coated onto a welding rod. The last two digits of the AWS number determine what type of coating is on the welding rod. This number also determines the type of current to use for arc welding applications.